Can’t remember the last time I went on a pub crawl. I’m ashamed to admit that I can’t actually remember the last time I went to a pub. 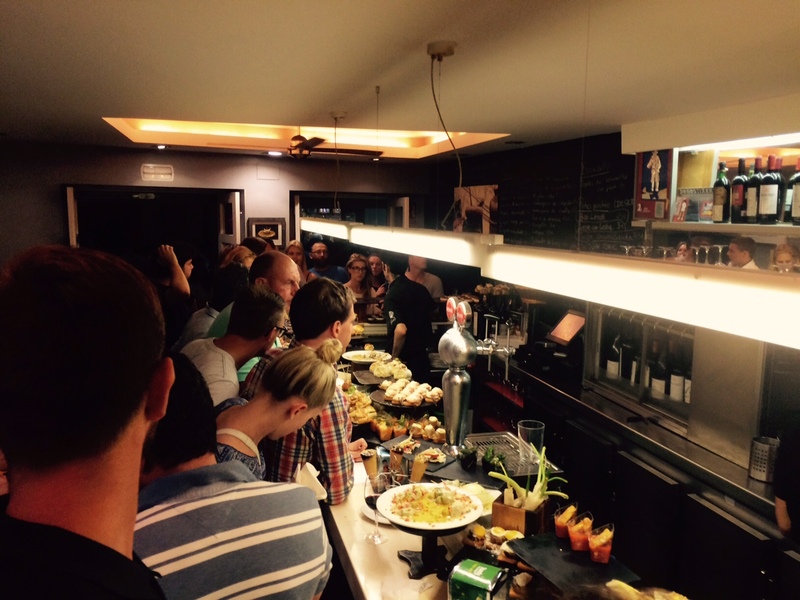 So it took visiting San Sebastian last week to reintroduce me to the joys of bar to bar drinking. And I had a ball. 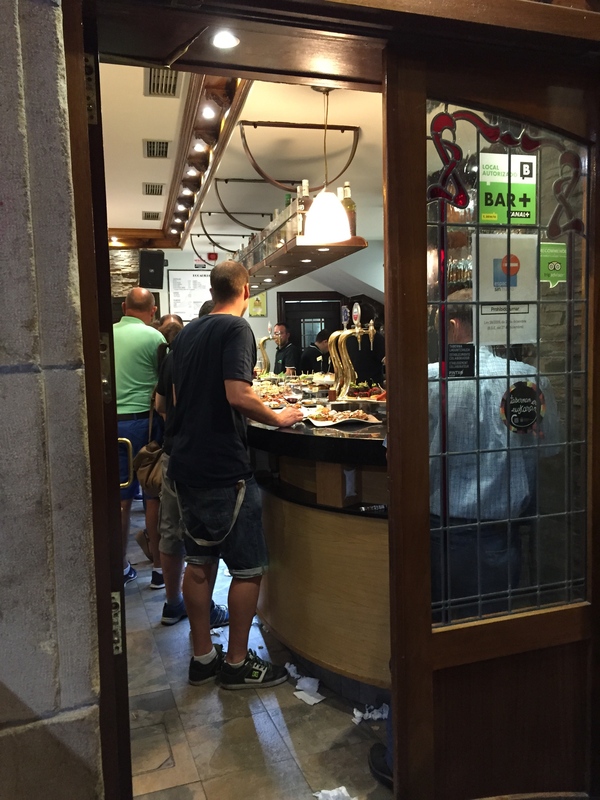 So what was I doing in San Sebastian? Apart from getting drunk, that is? I was taking the long way round to get to Majorca. After thirty years of airports and queues and being crammed into plane seats that are never quite big enough, 2015 was the year we decided to drive. We kicked off by spending twenty four hours on a Brittany ferry, experiencing the Bay of Biscay in all its choppy glory. 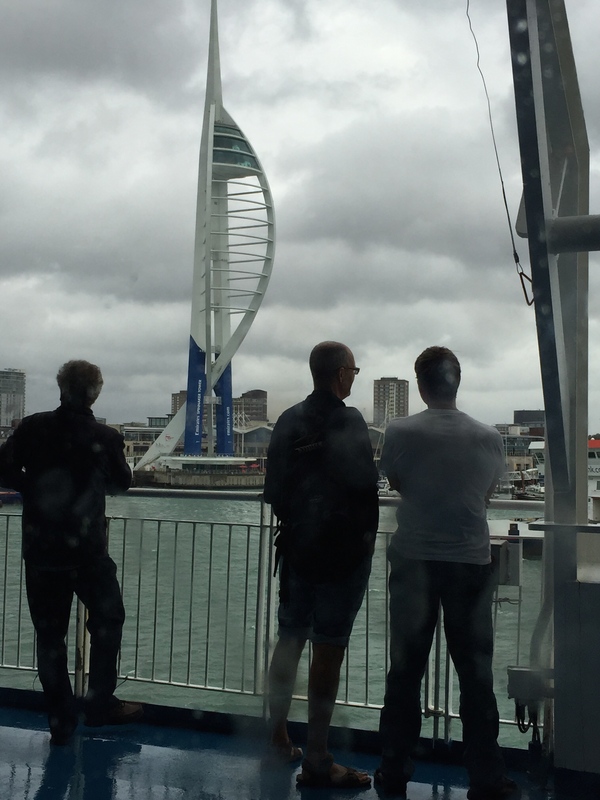 But we were leaving rain drenched Portsmouth for sunnier shores and we weren’t going to let a little bit of bumping around stop us from having a good time. The sun was shining in Bilbao when we made land. 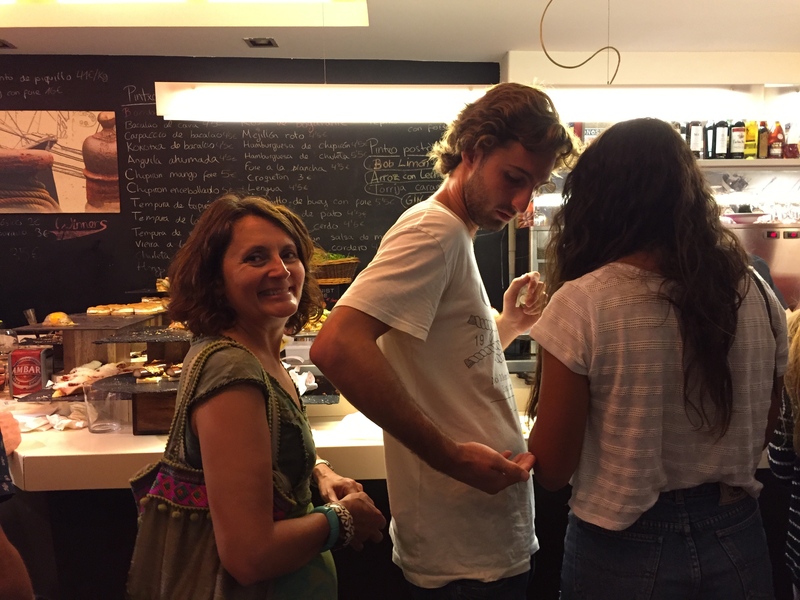 We had an interim night booked at a hotel in San Sebastian, so that’s where we headed, eager to make the most of a town we knew little about apart from the fact that we’d heard that it was the food centre of Spain. Which seemed like a pretty good reason for going there. It’s quite a challenge spending only one night in a place you don’t know. What to do? How to make the most of the time while you’re there? How to make sure you’re not having dinner in the place next door to the place that when you get home everybody will tell you was the only place to go in San Sebastian? The answer… we booked a local to guide us. Or more accurately, Graham booked a local to guide us. I have to be honest and tell you that this wasn’t my idea. And I wasn’t entirely sure it was a good one. Did we really want to spend our only night in this supposedly super-special place with a stranger? Would conversation be difficult? Wouldn’t it feel a bit awkward? The answers to the above questions are Yes, No and Absolutely Not! 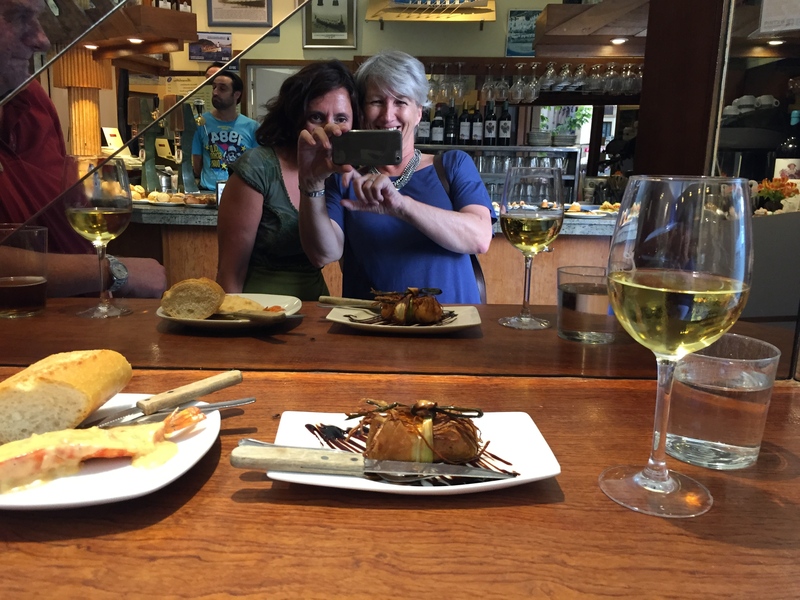 Because the local turned out to be Esther from San Sebastian Pintxos Tours. Who we met outside the tourist centre in the middle of the old town of San Sebastian. 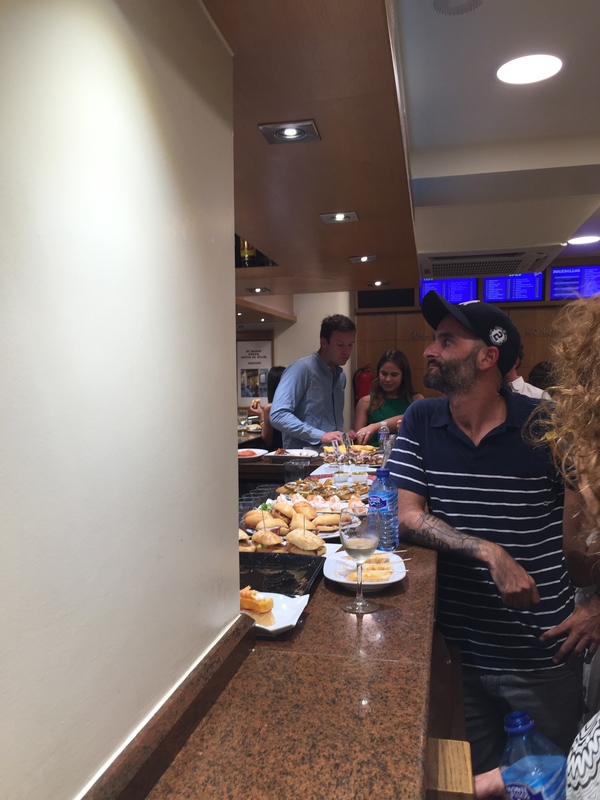 Who took us straight to our first Pintxos bar. Who introduced me to a drink called Tzakoli, (pronounced chakoli), a local Basque slightly fizzy white wine. Who ordered us our first few plates of Pintxos, the Basque equivalent to tapas. Who was smiley and charming and really good company. We were on our way. The streets of the old town are lined with Pintxos bars. On a Thursday night in downtown San Sebastian the world and his wife are out to have a good time. There’s a bustle and a buzz and a liveliness that is crying out to be joined. 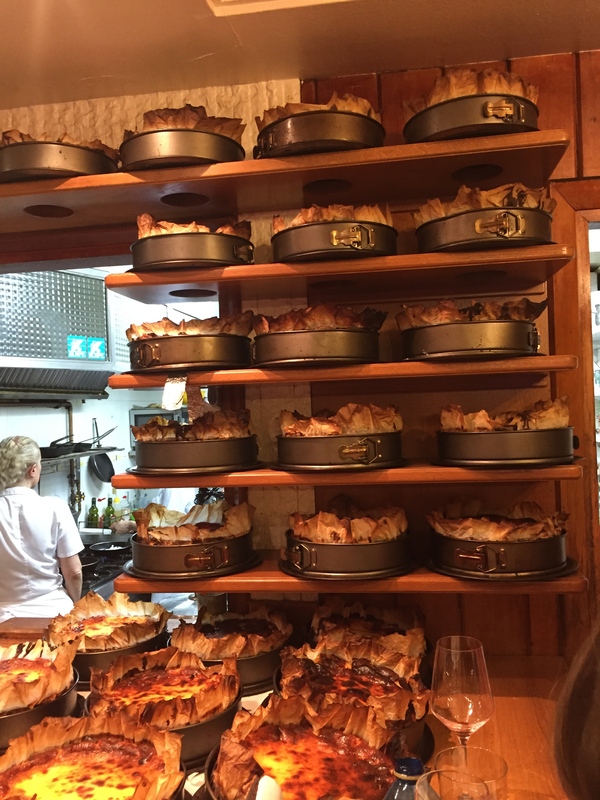 But you need to know which bars amongst all the bars are the best, which Pintxos out of all the plates out on display are the ones to choose, which way to turn when darkness falls and you’ve lost your bearings and, if you’re a lightweight like me, your ability to walk in a straight line! What you need is an Esther! We were booked to spend two hours with her: 7.30 to 9.30. She said goodbye to us at 11. Petite and determined, she threaded us through the crowds and bars and food choices like a tug boat with a couple of liners in tow. We went from the first bar to our next, where I had more wine and we tried a green chillie/olive combination which Esther explained was known as a ‘Hilda’ after the famous film actress. Famous film actress? Hilda? Hmmm…. Next bar, more food, another drink. Things were loosening up, we were really beginning to enjoy ourselves. I wish I could tell you what we ate. I know it was delicious. But it was all beginning to get a bit blurry. The one thing I can tell you was that Esther rarely chose from the plates on display. She ordered specials, the dishes you need to know about in order to ask for. Another advantage to being with a local. Outside Bar 4 – darkness falls! More bars, more food, more drink. We got to the point where Esther and I were both in such a merry state that Graham (who was sober, thank goodness) had to remind us, as we left one bar for the next, that we hadn’t paid. Our last bar was one of the best. So good that I can remember it clearly in spite of the state I was in. It was called La Vina and we stopped there for cheesecake. Because one of the things that La Vina is famous for is its cheesecakes. And let me tell you that this is not just any old cheesecake. This is the best cheesecake I’ve ever eaten. Drunk as I was I remember the taste of it like it was yesterday. Even if San Sebastian wasn’t as fantastic as it is, I would go back there to eat this cheesecake. 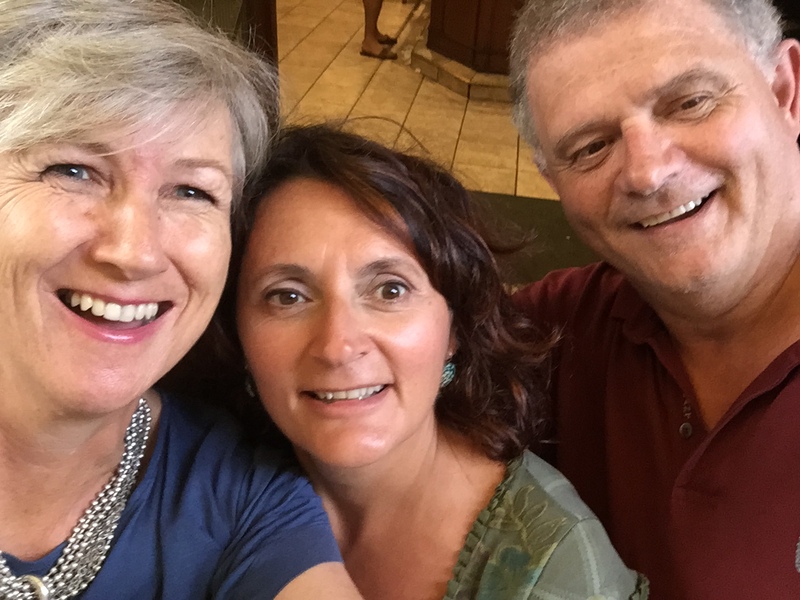 So we said goodbye to Esther. And Graham poured me into a taxi. And we went back to the hotel. 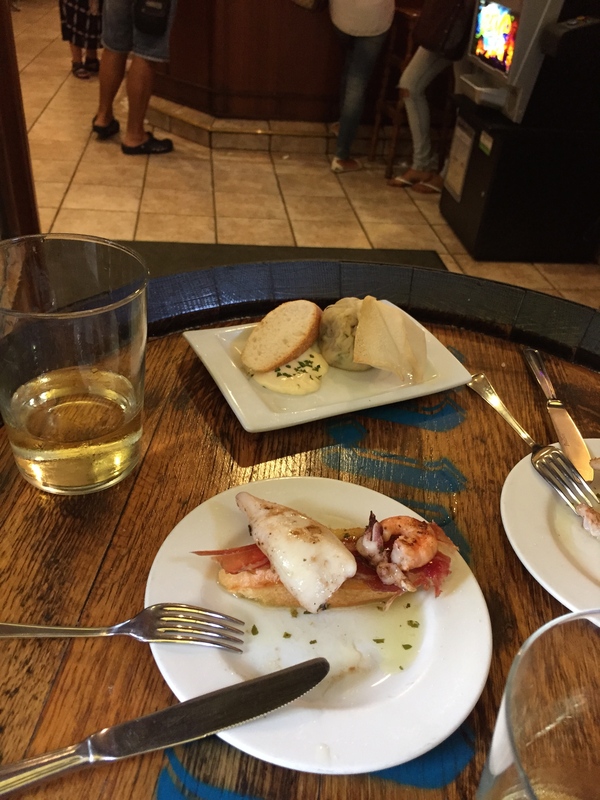 And I’m really glad that when I woke up in the morning – with a mouth like the inside of a parrot’s cage and a cracking headache – I could still remember that bar crawling in San Sebastian with Esther for a guide is the only way to travel. Thank you for such a funny post! 🙂 We enjoyed your tour again reading it! Hello Alfonso, it’s a pleasure! We loved every minute of it! Can’t wait to come back and do it again.